Yesterday (27th September) MEPs, the European Commissioner for Health & Food Safety Vytenis Andriukaitis and key figures from the animal welfare world united at the European Parliament to highlight the important developments to companion welfare in the EU. Organised by the EU Dog & Cat Alliance, key speakers included President of the Intergroup on the Welfare and Conservation of Animals Sirpa Pietikäinen MEP who also hosted the event. The EU Dog & Cat Alliance is calling for an Action Plan to tackle the illegal trade in dogs and cats in the EU. Last year the GSPCA had it’s BIGGEST every cruelty and first ever puppy trafficking case in Guernsey. Many will remember the 25 Slovakian puppies seized by the States Vet and Customs which were detained at the GSPCA and working together with the Guernsey Police resulted in a first for Guernsey in a multiple prosecution under the new Guernsey Animal Welfare Ordinance 2012 as well as other convictions. 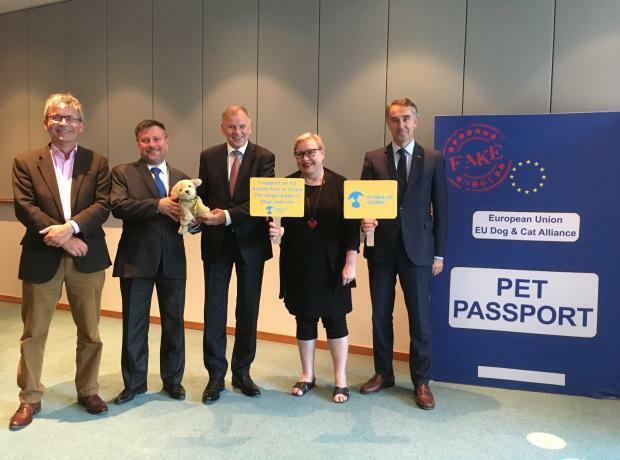 The EU Dog & Cat Alliance held its first event in the European Parliament on the 22nd of September. Throughout the day, members of the Alliance also had in-depth meetings with MEPs.